Launching the 2019 National Volunteer Year, the Central Committee of the Ho Chi Minh Communist Youth Union on January 18 and 19 sent a delegation to border posts located along the borderline in the southwestern province of An Giang. The dispatch was made as the country just marked the 40th anniversary of the victory of the war for the defence of the southwestern border and is welcoming the imminent traditional lunar New Year which will fall in early next month. 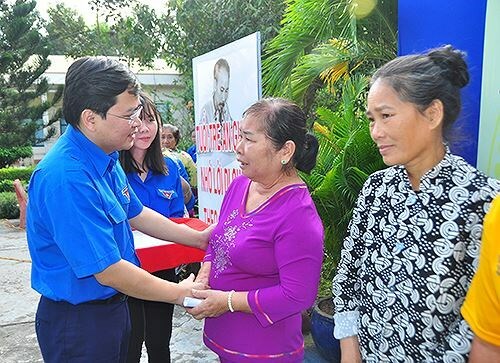 Speaking while visiting the Nhon Nhung border post in Tinh Bien district on January 19, Permanent Secretary of the committee Nguyen An Tuan asked the youth organisations to bring into full play the vanguard and volunteer role. Voluntary activities must be held regularly and manifest the creativeness of the youth, he said, asking for effective and suitable investment to the activities. Earlier, the delegation visited the Vinh Nguon border post on January 18. During the visits, youth representatives conducted free health checks and treatments to locals, planted trees, popularized traffic safety, and presented gifts to the poor of ethnic minority groups and veterans and invalids of the war.